The NHS - as we know - is under pressure. One of the priorities for the coming years is to get people living healthier lives to prevent illness. The health service is playing its part by thinking outside the box and using novel ways to get people active and engaged with their health. As we all know, gardening can be physically hard work. Digging or raking a lawn for 30 minutes requires as much energy as a 2km run, while trimming shrubs and plants is as good for you as walking. So it should come as no surprise that some doctors are promoting gardening to their patients. One of these is Dr Michael Dixon, a GP from Devon, who has been appointed NHS England's social prescribing lead to champion non-medical ways of treating patients. "It can have a huge impact. GPs see so many patients that don't necessarily need pills and potions but instead require something that gets them active, socialising or in touch with nature. What better activity is there than gardening?" He speaks from experience. For the last 10 years his practice has been running a social prescribing scheme that refers patients on to local activities from dance and art to, of course, gardening. His practice has a fruit and herb garden and next year, thanks to funding from a local housing developer, a community garden will open. Working mum Alice was told she was at high risk of developing type 2 diabetes by her GP. 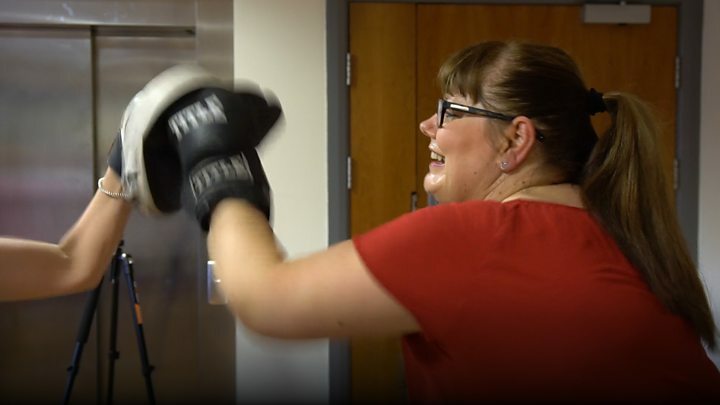 She was referred by her doctor to boxing lessons to help her get fitter and lose weight in order to keep the disease at bay. Her local surgery is taking part in a GP-led scheme in Leeds which is helping those affected by chronic illness to get fitter by offering exercise classes and advice to patients with a referral. Alice said when her doctor told her she was at risk it "frightened" her and her family, but she says she's now enjoying "the power that you get from being a boxer". Her personal trainer Claire helps patients with many different types of chronic illness and those with obesity. "The eventual aim is to try and help them deal with their pain, help them prevent certain illnesses and with that we've found we have a 100% pass rate with all our patients that we've signed off. So it's something that patients feel comfortable with because they can come to their GP surgery and attend an exercise session." And Alice says she has felt a big difference. "I actually feel not my age for a change. As a northern mum working full time, with kids, we've got this habit of always putting our families first, our jobs first, and we never make time just for ourselves. "But now my special treat is giving myself time to exercise, making myself healthier, then everybody else benefits within my family." Line dancing and drumming groups are just two of the novel ways people in the north west boroughs of Halton, St Helens and Knowsley are being encouraged to stay active and engaged. The opportunities are provided through the local social prescription service run by voluntary sector body Wellbeing Enterprises. It works by building on the resources that are available already locally, working with existing services, clubs and organisations to co-design and deliver the programmes on offer. Over the years this has involved linking up with singing clubs, dance classes, guitar clubs, knitting groups and local leisure centres. And it can even involve utilising the skills of patients who get referred to them, says Wellbeing Enterprises chief executive officer Mark Swift. "We had one patient who could play the ukuele so we set up a ukuele class. It really took off and we ran out of the instruments. On another occasion a doctor was referred to us who was a good tango dancer so she helped run a tango club. It helped her and many others. "It is about using the what is already available - there are some terrific schemes that exist in the community." A three-month follow-up with one group of patients showed they benefited from a 70% reduction in depression symptoms, an 80% improvement in well-being levels and 53% improvement in self-reported health status. In Lancashire, doctors are working with schools to encourage pupils to get active to combat child obesity. The idea has been borrowed from an initiative called the Daily Mile, which first got going in Stirling in Scotland. In Morecambe and Carnforth, a GP has taken it into local schools to encourage pupils to become fitter at a time of rising concern about child obesity. Dr Andy Knox has worked with school heads so that there is time each day for pupils to run one mile or take an equivalent amount of exercise indoors. He is part of the Better Care Together initiative in the area which brings together local health and social care leaders. The children are monitored every month for strength and stamina and they have seen marked improvements over the last year. And the teachers say pupils' concentration and behaviour has improved after the daily run. Some parents have taken their cue and started running each day. Children, interviewed by BBC News, said they enjoyed their runs though it was tough going when they started.